The best, longest lasting, wooden dog house available! Red Cedar and Treated Lumber are used to make our wooden dog house that will last for years. Not only that, our red cedar dog houses and cat houses reduce your carbon foot print because all of our wood categories (western red cedar, western spruce and pressure treated southern yellow pine) are environmentally friendly and a readily renewable resource; no old growth timber is utilized. Our dog house siding and roof materials are domestic western red cedar. Don’t be fooled by dog house manufacturers who simply claim their houses are “cedar." There are basically two species of cedar siding; western red cedar and white cedar. If a wooden dog house isn’t denoted as western red cedar, it's most likely white cedar. The difference is night and day. Western red cedar is virtually impervious to the outdoor elements. Painting or staining aren’t necessary for western red cedar, God designed it for the outdoors! On the other hand, white cedar is a much cheaper wood species that is quite similar to spruce. It is noted that the wood is both soft and weak, giving it poor screw-holding capabilities. It can not be used outdoors unless it is painted or stained. It is incorrect for anyone to advertise differently. Just as important as the species of cedar we utilize, our wooden dog houses are all hand assembled with screws and nails. Each house panel has the handwritten signature of the craftsman who assembled it. No automatic machine is used to cut, assemble, stain or glue any of our pet houses. Blythe Wood Works still builds handmade dog houses the American way, with craftsmen that care. One house at a time. If you look closely at our houses, you can see that we use a clear #1 grade siding in a narrow width pattern. Each piece of siding is double nailed on all houses up to Extra Large. Extra Large and up are tripled nailed. Some manufacturers claim they “screw” their siding; they have to because they use a wider, lower grade siding that would curl if it wasn’t screwed. Keeping the bugs out of your wooden dog house. 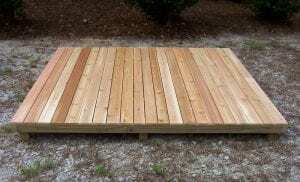 The base or floor system is the foremost important panel section of any wood dog or cat house. The upper structure can be constructed of the very best materials, assembled with the greatest skill, but if the floor foundation is not constructed with pressure treated wood, it will absolutely rot with ground contact. Termites always attack from the ground up and the floor is the first susceptible target, and they will eat cedar, both red, and especially white. Under ordinary circumstances, white cedar, western red cedar, spruce and pine lumber that has direct ground contact can begin to decay within a year. But properly pressure treated wood lasts twenty times longer, greatly reducing the amount of wood that would be required to replace untreated structures damaged by decay or termites. We also place tongue and groove red cedar on top of the treated floor joist in your wooden dog house. Some people have a misconception regarding the safety of pressure treated wood. It is perfectly safe for everyday use around your home, children and pets. Treated lumber is a non toxic product that only frustrates termites, fungus and decay. You can play barefoot on it, build garden beds out of it, lie out in the sun on it, or eat a picnic lunch on it. It is a truly green wood product. So, before you spend your hard earned money for a wooden dog house, make sure it's made with the highest quality wood, so that your dog or cat house will last at least as long as your pet.